Air India asked for a 20000 crore bail out. That is a lot of money. In all the likelihood it will get it. Not as a lump sum but in tranches. This pissed someone an awful lot – The private airlines. Why? They are in a mess and they need a bail out too. Bail out – the most over used word of 2008 is following us – like the Vodafone pugh into 2009. Only difference is – it is not as pleasant. Private airlines (Kingfisher, Jet Airways, Indigo, Spice Jet) pressed the panic button and went to the final resort. In India the final resort is not bankruptcy filing or a restructuring or leaning the business or firing people but to go on a strike. The concept of strike is so deep rooted in our DNA that if we don’t get what we need then we go on a strike. Only in this case airlines have to pull out of the strike as Indigo and SpiceJet ditched the union at the last minute. Also the government did not budge. The message from the government is clear. The taxes will be the same for the fuel and the airport charges will be the same and you do your business. Air India did not participate in the strike and for good reason. It doesn’t need to go on a strike but just need a cheque from big daddy. Kingfisher is reeling under a 8000 crore debt. It is not able to pay salaries of its employees and is now delaying the order of aircrafts. Jet Airways has shifted most of its planes and routes to operate in the low-cost mode. If it was Reliance and it needs money then it will go for an IPO or a private placement. But the airlines do not have the same luxury. Aviation in general and Indian aviation for long has been a loss making industry. Who would put money into an industry like this? Not the silicon valley investors and not the Singapore or Saudi Arabia’s sovereign wealth funds. They don’t because smart people do not shove their money into loss making and poorly run industries. That leaves us with the Indian government. This is really funny situation because the private airlines cannot fire people cannot ask for bailout cannot go on a strike and cannot shut the damn business. Which makes the private airlines not for profit organizations serving the country at large. This is to the government – If you want to meddle with the business then meddle fully and give the money. Else, just let them be. PS : Read this piece from Mint to know why airlines are asking for a bailout and not de-regulation. The Reality of Reality Shows And Is The Government Interference Justified? Identity Theft – Will it be the downside of Unique ID Project? India’s 1st Biofuel Flight Tested By SpiceJet: Can It Change Aviation Industry? yeah its a lot of money…They are in a mess and they need a bail out too. 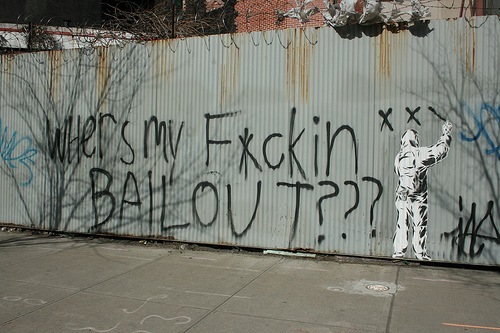 Bail out – the most over used word of 2008 is following us – like the Vodafone pugh into 2009. Only difference is – it is not as pleasant. Private Airlines don't need a bailout. It is like parents feeding baby, baby grown as a healthy person but unable to sustain himself and now wants to get rid off aged parents to get hold on their property to come out of financial mess. These private airlines have taken every advantage of Indian Airlines (now Air India) PSU character. Lobbied to get its offices close at strategic points, get profitable routes transferred to them, hired ex-IA staff, used IA maintenance facility and they got all. Now Kingfisher & Jet own 950 crore and 700 crore respectively to PSU oil companies. These oil companies being PSU are not able to get recovery, thus indirectly supporting their operations when Air India owes NONE. Kingfisher owes 80 crore to AI and Jet don't wants to discuss it publicly, see even AI supporting them financially. They may be asking for direct bail out but private airlines have varoius government agencies to support them where as AI has only Ministery of Civil Aviation which often treat it as "Garib ki Joroo….sab ki biwi".